Stock LS-1 throttle body off 2001 Camaro. ARP head, rod, crank studs. Innovative LM-1 wide band O2 system. T3/T4 turbo, .50/.63, self contained oil colling/recirculation system. Equal length runner turbo header. Dual BOV's, 1 electronically controlled, 1 mechanical. Custom built air to water intercooler. I can use all the advice I can get, links, data, files, diagrams, crayon sketches on toilet paper......... whatever, I really think this project will be the most fun for me yet. especially when I spank the Honda/Mitsu boys with my ECOTEC S-10. FYI - It's my intention to produce and offer these automatic transmission adapters once it's been fully tested and proven reliable. Additionally these small bell 700R4's are the same internally as the large bell V8 units. They can both be built so handle the same power levels wich can be as high as 850 Ft Lbs or Torque. The stock torque converters are the real weal link and you'll have to go aftermarket when your making some real power. The adapters are CNC machined from 1/2" think plate aluminum and contour the engine and transmission perfectly. 360 Degree pattern to cover all available "engine to adapter" and "adapter to transmission" bolt holes. Engine block to adapter strengthening braces. Modified and balanced flywheel with fully welded torque converter spaceing ring and crank dowel adapter. Grade "8" Hardware, instructions and Locktite. I'll post pics once I find the time to make it all look pretty .............. Thanks. Thanks to everyone over at j-body.org for the info. Great project. I'm interested in what your doing with the intake. I need to make a new one for my Ecotec this winter. I'm mostly interested in controlling my ignition on this engine. Wow ........ the pic is focused primarilly on the engine so I cant tell what it's installed in, but it looks very well engineered. What's it in ??? and what have you done for a transmission ??? I'd love to see more pics of the whole project. I'll be posting pics of the intake pretty soon once I get it finished, including pic's of the separate components. To give you an idea though, The runners are all equal length comming straight off the flange to the plenum. It's very similar to the Edelbrock Honda/Acura intakes but made mostly with thin wall steel tubing which keeps it very light in weight. What I did for the flange plate was machine a piece of thick wall steel that incororates the injector bungs as well. Then the whole thing was wittled down to look pretty in a Bridgeport Mill. The entire assembly will not be welded together but will be furnace brazed on an assembly jig. I designed the components this way specifically with production in mind. Currently the runners are all sized about 5% larger in diameter than the intake opening size on the head. I did this to keep the normally aspirated low speed velocity as high as possible so daily driving will be livable and keep me out of the boost around town. Since I'm not going for monster HP I can get away with this and let the turbo make up the difference. For higher HP & RPM applications I intend to build another version that simply uses larger runners and allows for a larger body. 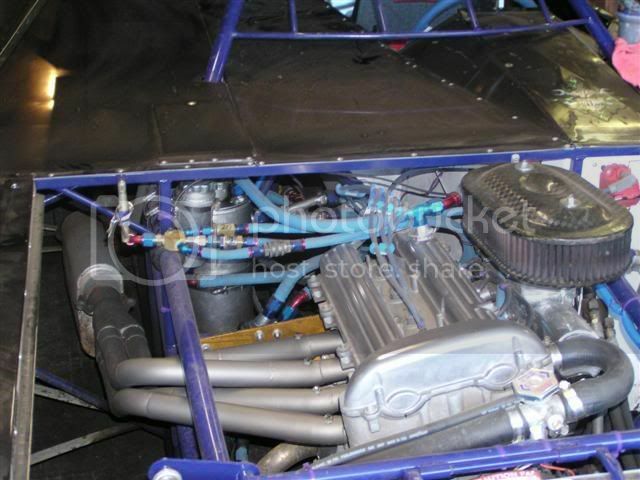 cool build, but u may want to rethink the transmission,i run a 3.1 chevy v6 which uses the same trans u are going to use. u are right on the converter being a weak point but that is not the only weak point, the small bellhousing transmissions have a 27 spline input shaft, even though they are identical as far as internal parts, u cant use the upgrade hard parts due to the fact its a 27 spline unit. so u are stuck with the weaker pump,shaft and drum assemblys. And even though I had addressed, constructed and solved all the issues you had mentiond, I found the end result of a Hybrid Converter and matching transmission to be "way too expensive" as a viable kit. I am now putting the finishing touches on a CNC machined adapter and custom flywheel to adapt to the conventional C-BOP pattern. This will allow anything from a Powerglide to the new 6-Speed RWD units as well.